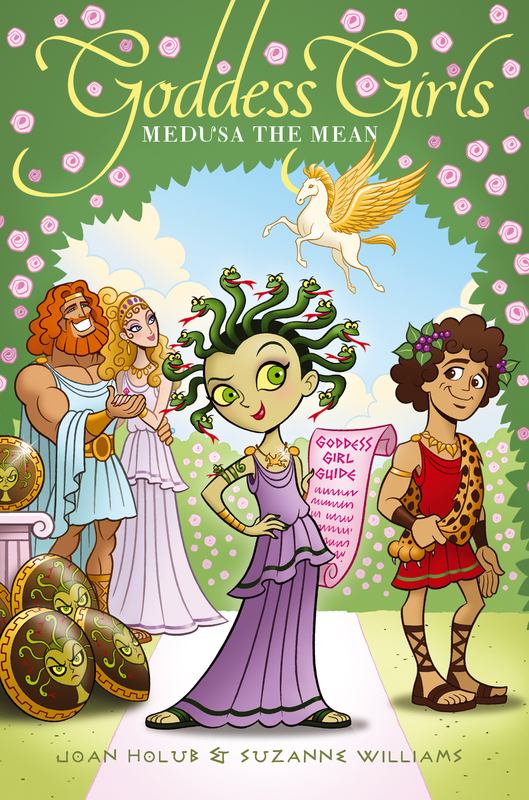 Medusa hopes immortality will put an end to her mean girl status—but her plan for popularity is unfavorably flawed. All Medusa wants is to be more like her two sisters and the other kids in her class: immortal. As the only mortal at Mount Olympus Academy, Medusa is sick and tired of being surrounded by beautiful, powerful, immortal classmates. It isn’t easy making friends, especially when you have snakes for hair and a reputation for being mean. Immortality, she thinks, will solve everything. So when Medusa finds out about a necklace that promises just that, she’s sure it will help her get the two things she covets most: to be as popular as the four Goddess Girls, and to have her supercrush, Poseidon, finally notice her. But when the necklace brings about popularity in the totally wrong way, things go from bad to worse. Can Medusa overcome her “meanie” status and prove that there’s more to her that meets the eye? DO YOU DREAM OF BEING A GOD OR A GODDESS? AND INSTANTLY ENJOY YOUR NEW POWERS! THE PRICE? ONLY 30 DRACHMAS! At the bottom of the page was an order form. Becoming immortal had been Medusa’s dearest wish since—well, since forever. It wasn’t fair that her two sisters were immortal while she’d been born a mere mortal. She studied the ad again. She wanted to believe it, but did she dare trust its claims? What if it was a trick? Could a flying-horse necklace really be the key to immortality? “Doubt it!” she muttered aloud. A godboy sitting nearby overheard and gave her a sideways glance. She shot him a quick glare that widened his eyes and made him nervously look away. It was Friday, last period, and the amphitheater was filled with immortal students—all of them beautiful, powerful, and awesome, with softly glittering skin. How she longed to be like them! Sure, she went to MOA too. She was one of the few lucky mortals allowed to attend the Academy. Yet she had no true magical powers, like those of a goddess. Still, with a glance she could turn a mortal to stone. That was something, at least. And she was the only student with snakes instead of hair growing from the top of her head! Glancing around, she idly reached up and twirled one of the snakes around her finger. Usually school dramas were performed in the amphitheater, but today the entire student body had gathered here because of Career-ology Week. (Or Job-ology Week, as the students called it.) All week long various speakers had come to MOA to talk about their jobs. Yesterday the god Hermes had told them all about his chariot delivery service. Today the goddess Hera was here speaking about her wedding shop in the Immortal Marketplace. The regallooking goddess had thick blond hair styled high upon her head and a no-nonsense look in her eye. Although she wasn’t unusually tall, something about her made her seem statuesque. Probably her confidence. As Hera explained how she went about planning a wedding at Hera’s Happy Endings, Medusa only half-listened. She shifted behind some other MOA students sitting in front of her, so she was better hidden from Hera’s view. Sneakily she re-read the ad. It was maddeningly short on details about how the Immortalizer worked—if it worked at all. She’d almost be willing to risk disappointment if only it didn’t cost so much. Thirty drachmas was a lot of money! Her weekly allowance was just three obeloi, which was half a drachma. At the moment she only had eight drachmas saved up. “Any questions?” Hera asked the crowd. Medusa jolted to attention and peered around the godboy in front of her. Seeing that the talk was nearly over, she set her scrollazine on the bench. Although the bleachers were packed with students, there was an empty space on either side of her. No one ever got too close to a girl with snake hair. Since class participation counted for a third of her Job-ology grade, she quickly tried to think up a question. But how could she when she hadn’t heard a word Hera had said! Medusa rolled her eyes when Athena raised her hand. What a Goody Two-sandals! She was always the first to ask questions in class. Athena was not only the brainiest girl at MOA, she was also Principal Zeus’s daughter. And soon she’d be Hera’s stepdaughter too, because Zeus and Hera were getting married in nine days—just a week from Sunday. Medusa craned her neck to look at Zeus. He was in the audience, sitting front row center, gazing adoringly at Hera. They’d announced their engagement not long ago during the boys’ Olympic Games. Now the whole school was abuzz with the news of their upcoming marriage. “Who will your bridesmaids be?” Athena asked when she was called on. Athena’s shoulders drooped, and her long brown hair swayed in an annoyingly cute, curly way as she slowly shook her head. She had to be less than thrilled with this answer. She’d probably thought she had a clear shot at becoming a bridesmaid. Another goddessgirl asked a question. Then pale, mysterious Persephone asked about the flowers for the wedding. Apparently her mom’s flower shop would be providing them. Next Aphrodite—the most beautiful goddessgirl at MOA—waved her hand in the air. Even from high up in the bleachers, Medusa could see that Aphrodite’s perfectly manicured fingernails were polished a sparkly robin’s-egg-blue that matched the chiton she wore. As Medusa squinted at the goddessgirl’s fingernails, the color of the polish changed, first to turquoise, then pink, then back to blue. Must be nice to possess magic that makes your nail polish change colors, she thought sourly. Goddessgirls took that kind of thing for granted. “What will your gown look like?” Aphrodite asked when called on. Ye gods, thought Medusa. Not that she cared, but what did these questions have to do with Job-ology, anyway? They were all personal questions! Tuning out Hera’s answer, she realized that almost all the girls seemed mesmerized by this froufrou marriage stuff. It made sense for Aphrodite, since she was the goddessgirl of love. But why were the others so interested? She didn’t get it. She watched the sun catch in Aphrodite’s long golden hair as the goddessgirl tucked a curl behind one ear. It was a trademark Aphrodite move that drew boys’ eyes like a magnet. Although Medusa had tried to do it with her snake hair once, it just didn’t have the same effect. At least dark-haired Artemis, who sat one row below Medusa, seemed a little bored. She had dumped some arrows out of her quiver and was checking their tips for wear. Medusa could relate. This whole marriage thing was a big yawn. She’d be glad when it was over. Medusa had carefully chosen her spot on the bleachers today. Studying Athena, Persephone, Aphrodite, and Artemis—the most popular goddessgirls in school—was practically her full-time job, though she made sure no one ever noticed. And although she’d never admit it, she was green with envy when it came to those four. Literally. Her skin, eyes, and hair were all green. Besides immortality, there were just two other things she wanted in life: to be as effortlessly popular as the four goddessgirls and to have her supercrush suddenly decide he liked her. Unfortunately, both seemed way out of reach. She didn’t trust anyone enough to let down her guard with them and become friends. And how can you be popular without friends? As far as her crush went, well . . .
“My turn!” a nearby godboy said to his friends in an excited but muted tone. She’d know that voice anywhere. Poseidon. Oh-so-casually she looked his way. He was sitting three rows down from her with two other godboys—Dionysus and Ares. Weddings obviously didn’t interest them either, since they were secretly playing a game of Javelin Thump. Poseidon was carefully aiming a piece of papyrus that had been folded into a fat triangle about two inches on its long side. As she watched, he flicked it across the seat with his middle finger. “Score!” he exclaimed in a whisper as the triangle slid between Dionysus’s two fingers, which marked the goalposts. His flick had been so strong, however, that the little triangle javelin kept on going. There was a mad scramble to grab it before it slid off the edge of the boys’ bench, but they weren’t fast enough. It dropped onto the ground by their feet. Before the boys could catch her watching them, Medusa made herself look away. Still, if she could’ve gotten away with it, she would’ve stared at blond, turquoise-eyed Poseidon all day long. Feeling someone’s gaze, she glanced up into a pair of violet eyes. For some reason, Dionysus was looking at her now. Assuming the worst, she peeked down, checking to be sure her underwear wasn’t showing. “If there are no further questions . . .” said Hera, snagging Medusa’s attention once more. Uh-oh! She still hadn’t spoken up. Quickly she raised her hand. “Yes?” Hera had to crane her neck to look up at her. Students nearby gasped at her bluntness. She felt Athena glare at her. But she was used to being on the receiving end of glares. She’d never been exactly popular. Far from it, in fact. Stirring up trouble and making others uncomfortable were abilities that came naturally to her. They were her strengths. She wondered what kind of job Hera would suggest she use that talent for! At her reply Zeus frowned darkly and crossed his arms. Wide gold bands flashed at his wrists. After taking a few more questions, Hera left the stage. Zeus joined her, gesturing like he was trying to convince her of something as they headed off. At seven feet tall with bulging muscles, wild red hair, piercing blue eyes, and a fearsome temper, he usually got his way in any argument. Medusa wondered if he would succeed this time. Now that the lecture was over, students began to exit the bleachers. Medusa dawdled, waiting for the others below her to leave before she stood. Stepping down two rows of seats, she pretended to accidentally drop her Teen Scrollazine under the bench where Poseidon had sat. She stooped and reached for the papyrus javelin that he and his friends had left behind. Tucking it in the pocket of her chiton, she then picked up her scrollazine and straightened—only to find Aphrodite standing in front of her. Startled, Medusa jumped. All twelve of her snakes hissed in surprise. “Give me a heart attack, why don’t you?” she said in annoyance. Godness! She never should have told the truth a few weeks ago when Aphrodite had asked why she didn’t like her. What Medusa had replied was something like, “Everything’s so easy for you just because you’re pretty. You don’t even have to try, and boys adore you. It’s not fair.” She hoped Aphrodite didn’t feel sorry for her because of that, but she had a feeling she did. Because now Aphrodite was always trying to be fake-friendly and include her in things. Medusa was sure she and the other goddessgirls didn’t really want her butting in. “Sorry. I’m busy,” Medusa replied tartly, even though she did kind of want to hang out with them. “Stuff.” Medusa’s fingers toyed with the papyrus javelin in her pocket. She really did have something to do, but she wasn’t about to tell Aphrodite what it was. Because it was a big secret!